Copper highlights, pastel pink, and so much more. If you're anxiously waiting to bid farewell to the train wreck that was 2018, you aren't alone. The new year is officially upon us, and that means a fresh batch of hair color trends are about to get big. Yup, the hues that defined 2018—think: rose-gold highlights, fiery reds, and icy platinum shades—will soon be replaced by a whole new lineup. 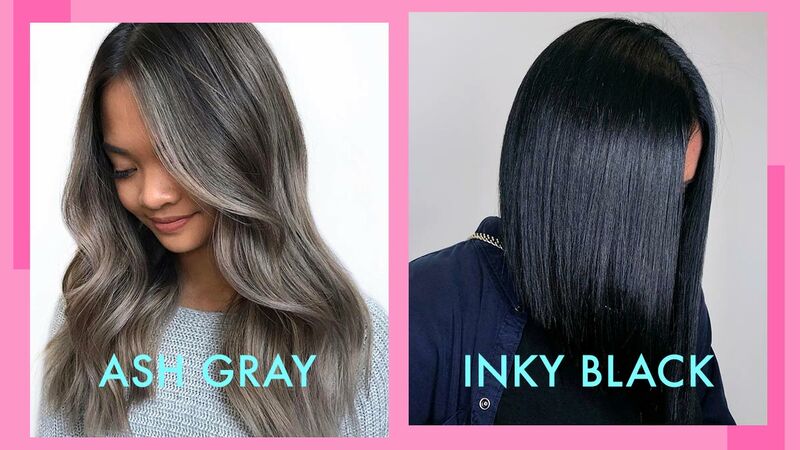 And, spoiler, the hair colors of 2019 are really good—so good, you'll have a hard time settling on just one. Ahead, seven shades you're going to see everywhere in the new year. Here's hoping you have your colorist's number on speed dial. Classic chestnut hues will get a subtle upgrade come 2019, thanks to face-framing, light-brown highlights. Miranda Kerr has already jumped on the trend, adding dimension to her iconic brunette hair with sleek, golden highlights. The best part about this color is that it's so easy to maintain—especially if you're starting with a brown base. Nope, this isn't the angsty shade you dreamed about during your goth phase in the early aughts. This rich, inky-black is all about shine—the glossier, the better. Preserving your shade is crucial with this hue, so make sure you stock up on color-enhancing products (like a hydrating, sulfate-free shampoo) before booking your appointment. If you'd like to dip your toes into the dark side without committing to a full-on black look, ash gray is an obvious choice. The darkest sections will be along your roots (read: super ideal for grow out), with a light, moody gray toward your ends. It isn't often that a wearable hair color trend comes out of fashion week, but the pastel hues that dotted the Marc Jacobs Spring 2019 runway may just inspire you to go bold this year. Models wore shades of blue, lavender, and orange, but it was the soft, cotton-candy pink that arguably stole the show. Consider this bright shade the 2019 version of rose gold. If you've officially reached platinum fatigue but aren't quite ready to part with your signature hue, white blonde is your calling card. The inspiration behind this shade is the sun-brightened, natural streaks you'd find on surfers or little kids. Just make sure you ask your stylist to lean towards pale blonde tones rather than pure icy. Following 2018's obsession with rich, fiery hues, you can expect to see a spike in more subdued copper tones come 2019. Classic, chocolate brown will be enhanced with all-over copper highlights for a look that’s equal parts low-key and pretty. Think of this hue as the perfect middle ground between golden blonde and vibrant copper. With plenty of dimension and shine, this creamy shade is the subtle way to tiptoe into red without fully committing.